I want you to be sad. I want you to be angry. I want you to understand. Nick Falkner is an Australian academic with a pretty interesting career path. He is also a culture sponge and, given that he’s (very happily) never going to be famous enough for a magazine style interview, he interviews himself on one of the more confronting images to come across the wires recently. For clarity, he’s the Interviewer (I) when he’s asking the questions. Interviewer: As you said, “I want you to be sad. I want you to be angry. I want you to understand.” I’ve looked at the picture and I can see a lot of people who are being associated with a mass cheating scandal in the Indian state of Bihar. This appears to be a systematic problem, especially as even more cheating has been exposed in the testing for the police force! I think most people would agree that it’s a certainly a sad state of affairs and there are a lot of people I’ve heard speaking who are angry about this level of cheating – does this mean I understand? Basically, cheating is wrong? Nick: No. What’s saddening me is that most of the reaction I’ve seen to this picture is lacking context, lacking compassion and, worse, perpetrating some of the worst victim blaming I’ve ever seen. I’m angry because people still don’t get that the system in place is Bihar, and wherever else we put systems like this, is going to lead to behaviour like this out of love and a desire for children to have opportunity, rather than some grand criminal scheme of petty advancement. Interviewer: Well, ok, that’s a pretty strong set of statements. Does this mean that you think cheating is ok? Nick: (laughs) Well, we’ve got the most usual response out of the way. No, I don’t support “cheating” in any educational activity because it means that the student is bypassing the learning design and, if we’ve done our job, this will be to their detriment. However, I also strongly believe that some approaches to large-scale education naturally lead to a range of behaviours where external factors can affect the perceived educational benefit to the student. In other words, I don’t want students to cheat but I know that we sometimes set things up so that cheating becomes a rational response and, in some cases, the only difference between a legitimate advantage and “cheating” is determined by privilege, access to funds and precedent. Nick: You want evidence! Ok. Let’s start with some context. Bihar is the third-largest state in India by population, with over 100 million people, the highest density of population in India, the largest number of people under 25 (nearly 60%), a heavily rural population (~85%) and a literacy rate around 64%. Bihar is growing very quickly but has put major work into its educational systems. From 2001 to 2011, literacy jumped from 48 to 64% – 20 of those percentage points are in increasing literacy in women alone. If we took India out of the measurement, Bihar is in the top 11 countries in the world by population. And it’s accelerating in growth. At the same time, Bihar has lagged behind other Indian states in socio-economic development (for a range of reasons – it’s very … complicated). Historically, Bihar has been a seat of learning but recent actions, including losing an engineering college in 2000 due to boundary re-alignment, means that they are rebuilding themselves right now. At the same time, Bihar has a relatively low level of industrialisation by Indian standards although it’s redefining itself away from agriculture to services and industry at the moment, with some good economic growth. There are some really interesting projects on the horizon – the Indian Media Hub, IT centres and so on – which may bring a lot more money into the region. Interviewer: Ok, Bihar is big, relatively poor … and? Nick: Not just that! This will have an impact on whether they live in a house with 24 hour power. On whether they will have an inside toilet. On whether they will be able to afford good medicine when they or their family get sick. On whether they will be able to support their parents when they get old. On how good the water they drink is. As well, yes, it will help them to get into a University system where, unfortunately, existing corruption means that money can smooth a path where actual ability has led to a rockier road. The article I’ve just linked to mentions pro-cheating rallies in Uttar Pradesh in the early 90s but we’ve seen similar arguments coming from areas where rote learning, corruption and mass learning systems are thrown together and the students become grist to a very hard stone mill. And, by similar arguments, I mean pro-cheating riots in China in 2013. Student assessment on the massive scale. Rote learning. “Perfect answers” corresponding to demonstrating knowledge. Bribery and corruption in some areas. Angry parents because they know that their children are being disadvantaged while everyone else is cheating. Same problem. Same response. Nick: I’m going to stop you there. Every time that we’ve forced students to resort to rote learning and “perfect answer” memorisation to achieve good outcomes, we’ve constructed an environment where carrying in notes, or having someone read you answers over a wireless link, suddenly becomes a way to successfully reach that outcome. The fact that this is widely used in the two countries that have close to 50% of the world’s population is a reflection of the problem of education at scale. Are you volunteering to sit down and read the 50 million free-form student essays that are produced every year in China under a fairer system? The US approach to standardised testing isn’t any more flexible. Here’s a great article on what’s wrong with the US approach because it identifies that these tests are good for measuring conformity to the test and its protocol, not the quality of any education received or the student’s actual abilities. But before we get too carried away about which countries cheat most, here are some American high school students sharing answers on Twitter. Every time someone talks about the origin of a student, rather than the system that a student was trained under, we start to drift towards a racist mode of thinking that doesn’t help. Similar large-scale, unimaginative, conform-or-perish tests that you have to specifically study for across India, China and the US. What do we see? No real measurement of achievement or aptitude. Cheating. But let’s go back to India because the scale of the number of people involved really makes the high stakes nature of these exams even more obvious. Blow your SATs or your GREs and you can still do OK, if possibly not really well, in the US. In India… let’s have a look. State Bank of India advertised some entry-level vacancies back in 2013. They wanted 1,500 people. 17 million applied. That’s roughly the adult population of Australia applying for some menial work at the bank. You’ve got people who are desperate to work, desperate to do something with their lives. We often think of cheats as being lazy or deceitful when it’s quite possible to construct a society so that cheating is part of a wider spectrum of behaviour that helps you achieve your goals. Performing well in exams in India and China is a matter of survival when you’re talking about those kinds of odds, not whether you get a great or an ok job. Interviewer: You’d use a similar approach to discuss the cheating on the police exam? Interviewer: So why do you want us to be sad? Nick: I don’t actually want people to be sad, I’d much prefer it if we didn’t need to have this discussion. But, in a nutshell, every parent in that picture is actually demonstrating their love and support for their children and family. That’s what the human tragedy is here. 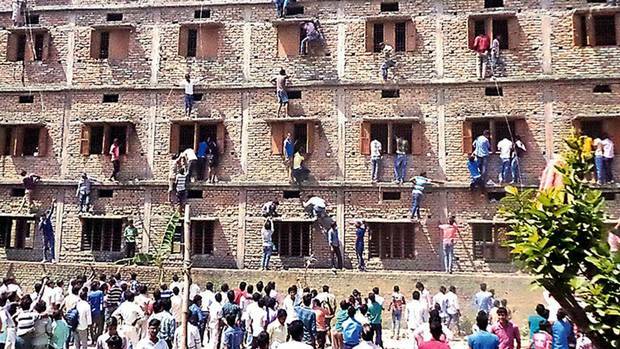 These Biharis probably don’t have the connections or money to bypass the usual constraints so the best hope that their kids have is for their parents to risk their lives climbing walls to slip them notes. I mean, everyone loves their kids. And, really, even those of us without children would be stupid not to realise that all children are our children in many ways, because they are the future. I know a lot of parents who saw this picture and they didn’t judge the people on the walls because they could see themselves there once they thought about it. But it’s tragic. When the best thing you can do for your child is to help them cheat on an exam that controls their future? How sad is that? Interviewer: Do you need us to be angry? Reading back, it sounds like you have enough anger for all of us. Nick: I’m angry because we keep putting these systems in place despite knowing that they’re rubbish. Rousseau knew it hundreds of years ago. Dewey knew it in the 1930s. We keep pretending that exams like this sort people on merit when all of our data tells us that the best indicator of performance is the socioeconomic status of the parents, rather than which school they go to. But, of course, choosing a school is a kind of “legal” cheating anyway. Interviewer: Ok, now there’s a controversial claim. Interviewer: So it all evens out? Nick: (laughs) No, but I have heard people say that. Basically, sending your kids to a “better” school, one of the private schools or one of the high-performing publics, especially those that offer International Baccalaureate, is not going to hurt your child’s chances of getting a good Tertiary entry mark. But, of course, the amount of money required to go to a private school is not… small… and the districting of public schools means that you have to be in the catchment to get one of these more desirable schools. And, strangely enough, once you factor in the socio-economic factors and outlook for a school district, it’s amazing how often that the high-performing schools map into higher SEF areas. Not all of them and there are some magnificent efforts in innovative and aggressive intervention in South Australia alone but even these schools have limited spaces and depend upon the primary feeder schools. Which school you go to matters. It shouldn’t. But it does. So, you could bribe someone to make the exam easier or you could pay up to AUD $24,160 in school fees every year to put your child into a better environment. You could go to your local public school or, if you can manage the difficulty and cost of upheaval, you could relate to a new suburb to get into a “better” public school. Is that fair to the people that your child is competing against to get into limited places at University if they can’t afford that much or can’t move? That $24,000 figure is from this year’s fees for one of South Australia’s most highly respected private schools. That figure is 10 times the nominal median Indian income and roughly the same as an experienced University graduate would make in Bihar each year. In Australia, the 2013 median household income was about twice that figure, before tax. So you can probably estimate how many Australian families could afford to put one, or more, children through that kind of schooling for 5-12 years and it’s not a big number. The Biharis in the picture don’t have a better option. They don’t have the money to bribe or the ability to move. Do you know how I know? Because they are hanging precariously from a wall trying to help their children copy out a piece of information in perfect form in order to get an arbitrary score that could add 20 years to their lifespan and save their own children from dying of cholera or being poisoned by contaminated water. Some countries, incredibly successful education stories like Finland (seriously, just Google “Finland Educational System” and prepare to have your mind blown), take the approach that every school should be excellent, every student is valuable, every teacher is a precious resource and worthy of respect and investment and, for me, these approaches are the only way to actually produce a fair system. Excellence in education that is only available to the few makes everyone corrupt, to a greater or lesser degree, whether they realise it or not. So I’m angry because we know exactly what happens with high stakes exams like this and I want everyone to be angry because we are making ourselves do some really awful things to ourselves by constantly bending to conform to systems like this. But I want people to be angry because the parents in the picture have a choice of “doing the right thing” and watching their children suffer, or “doing the wrong thing” and getting pilloried by a large and judgemental privileged group on the Internet. You love your kids. They love their kids. We should all be angry that these people are having to scramble for crumbs at such incredibly high stakes. But demanding that the Indian government do something is hypocritical while we use similar systems and we have the ability to let money and mobility influence the outcome for students at the expense of other students. Go and ask Finland what they do, because they’re happy to tell you how they fixed things but people don’t seem to want to actually do most of the things that they have done. Interviewer: We’ve been talking for a while so we had better wrap up. What do you want people to understand? Nick: What I always want people to understand – I want them to understand “why“. I want them to be able to think about and discuss why these images from a collapsing educational system is so sad. I want them to understand why our system is really no better. I want them to think about why struggling students do careless, thoughtless and, by our standards, unethical things when they see all the ways that other people are sliding by in the system or we don’t go to the trouble to construct assessment that actually rewards creative and innovative approaches. I want people to understand that educational systems can be hard to get right but it is both possible and essential. It takes investment, it takes innovation, it takes support, it takes recognition and it takes respect. Why aren’t we doing this? Delaying investment will only make the problem harder! Really, I want people to understand that we would have to do a very large amount of house cleaning before we could have the audacity to criticise the people in that photo and, even then, it would be an action lacking in decency and empathy. We have never seen enough of a level playing field to make a meritocratic argument work because of ingrained privilege and disparity in opportunity. Interviewer: So, basically, everything most people think about how education and exams work is wrong? There are examples of a fairer system but most of us never see it? Nick: Pretty much. But I have hope. I don’t want people to stay sad or angry, I want those to ignite the next stages of action. Understanding, passion and action can change the world. Interviewer: And that’s all we have time for. Thank you, Nick Falkner!